Is the ESRB's Time Running Out? In some respects, the ESRB has finally hit its stride. But in refusing to grow in response to the increasing prevalence of online gaming, digital distribution and user-created content, it's already becoming obsolete. 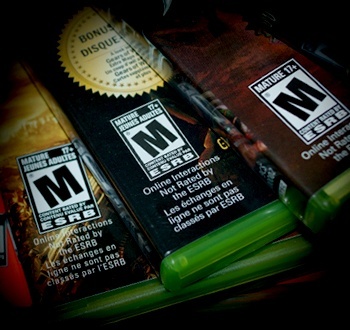 On September 1st, the Entertainment Software Ratings Board (ESRB) turned 15 years old. As videogames become increasingly central to our modern culture in the United States - and the rest of the world, too - this anniversary was likely a happy one for the ESRB's earliest supporters. After a tumultuous and rocky birth in the wake of the Mortal Kombat controversy, and a decades-long struggle to establish legitimacy that was undermined by things like the Hot Coffee controversy, the ESRB has won over old enemies like the National Institute on Media and the Family, and the road ahead is glorious ... right? The most pressing problem is the ESRB's reluctance to address online interactions. Seeing as we're moving more and more toward online and internet-enabled games, this inevitably limits the ESRB's authority as a ratings board. Although the ESRB rates the submitted developer content within online games, these ratings are always qualified by an important disclaimer: "Online Interactions Not Rated by the ESRB." To date, this has meant that the rating given to the designed game content doesn't cover chat and other forms of player-to-player communication. That's unfortunate, because the ESRB's intimate relationship with the game industry could provide it with a unique vantage point from which to evaluate aspects of online games that are beyond the purview of other would-be raters, including the quality of the game's moderation system, programmed restrictions on chat and known player demographics. The organization is missing out on a great opportunity to provide parents and children with a resource that enables informed choices beyond the enforced restriction of filters, a noble cause given that children play more online games than any other format. The ESRB's reluctance to step in means that a large proportion of the games kids actually play aren't being rated at all. Can the ESRB manage to buck the trend and start to change even while it's on top of the world? Or is it doomed to become a dinosaur that can't adapt to the steadily-evolving pace of technology in gaming? Read more about the subject in "Obsolescence Pending: Rating the ESRB" by Sara Grimes in Issue 223 of The Escapist.